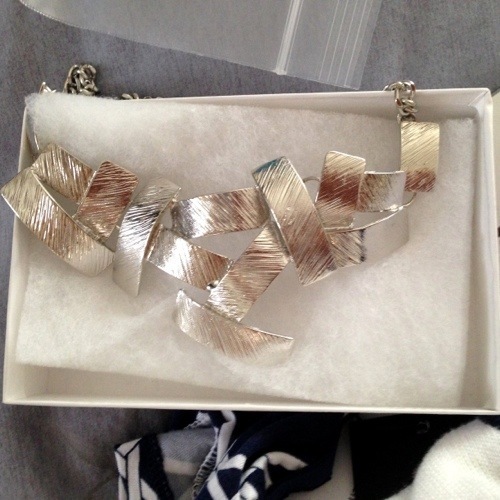 My latest Stitchfix package came in the mail this week and I’m excited to share what I got with you. I got a fix last month, but I didn’t post about it. Boo, I know. I sorry. I have forgotten how much you all enjoy reading about them. 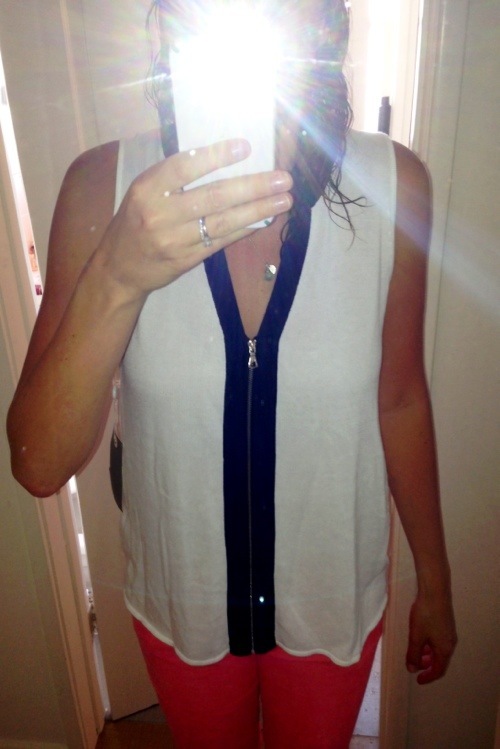 But I hope my Stitchfix July review makes up for it! For those of you who are not familiar with Stitchfix, it is a try on at home delivery service where you fill out an extensive 80 question quiz to understand your fashion and clothing style, how much you want to pay for certain items, and what you are looking for. Then for a $20 styling fee they send you 5 items. If you like all 5, you can get 25% off your entire order. Or just keep what you like and send back what you don’t. 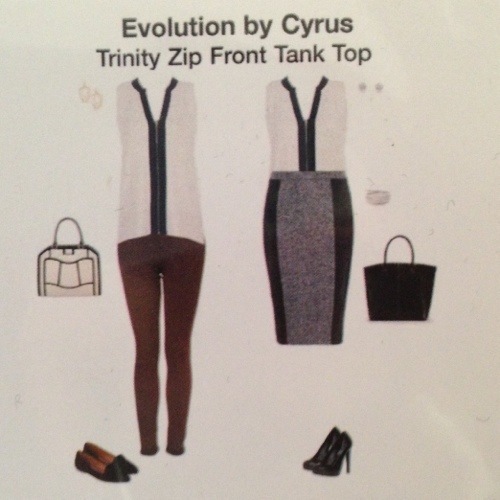 Your $20 styling fee is applied to your order so you are incentivized to at least keep something. I LOVE this service and have been using it for over 8 months now. This was my 9th fix. According to the person who runs the Stitchfix Twitter, I am one of their most loyal customers. Woo hoo! This was super cute and immediately I wondered if I got a red dress. I remember getting a red dress with a tie strap in one of my previous fixes. I liked it, but I decided I didn’t really need another necklace. I put this in the maybe pile. I liked this tank top because it was different, but I felt like it was a bit too frumpy looking on me. When I tried on this dress I didn’t love the way it looked on me. It actually looks better in the picture than it did in person. This was a very different look for me. 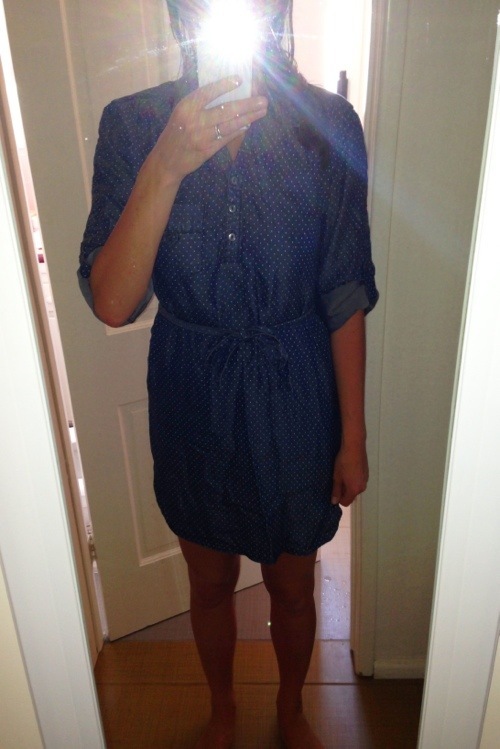 I would never get a denim shirt like this let alone a dress. This dress was frumpy to the max. It immediately went into the return pile. But it was fun to try on! I liked the way this top looked and decided to keep it. The picture doesn’t do it justice – it does look better in person. I plan on wearing it with white pants. Not sure it goes with the pants I’m wearing in the picture. So what did I end up picking? I really liked everything but the denim dress. I decided to keep the blue printed top and return the remaining items. 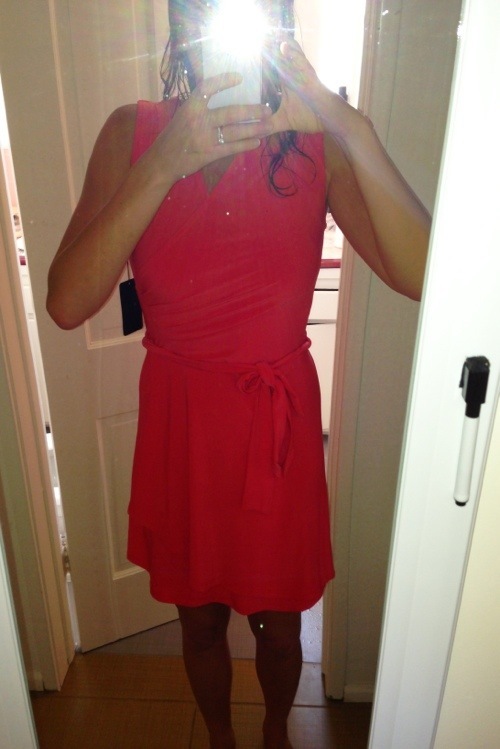 Now looking back on this post I wish I would have kept the red dress too, but I don’t have anything coming up where I could foresee wearing it so I decided not to get it. Oh well, there’s always next time! 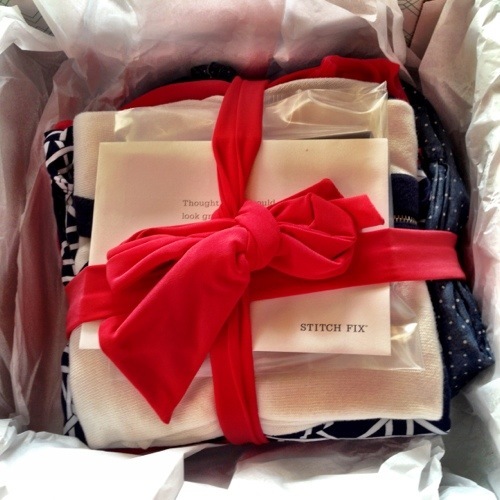 If you are interested in checking out Stitchfix, you can sign up here. There is a waiting list and last time I heard it was a couple weeks long. 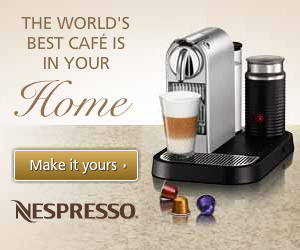 I do not get paid for these posts, but if you sign up using my link, I do receive a referral credit. Help me help you! What do you think of what I received? 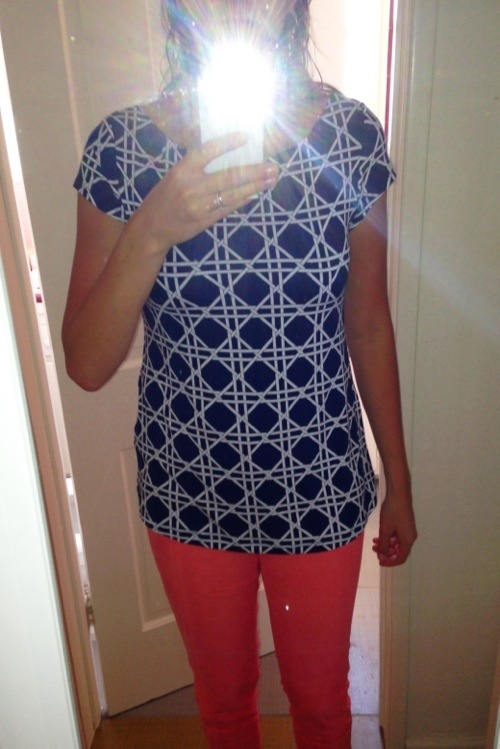 Have you ever tried Stitchfix? Post in the comments and let me know! The red dress looked sexay!! Haha, yeah it looks way better in the photo than it did in person! What a great idea. I hate shopping, mostly because I have a hard time picking things out that I think will look good on me. This might be fun to try. How are the prices compared to buying in-store? I’m the same way. I can never tell if an item will look good on me just by looking at it on a hanger. 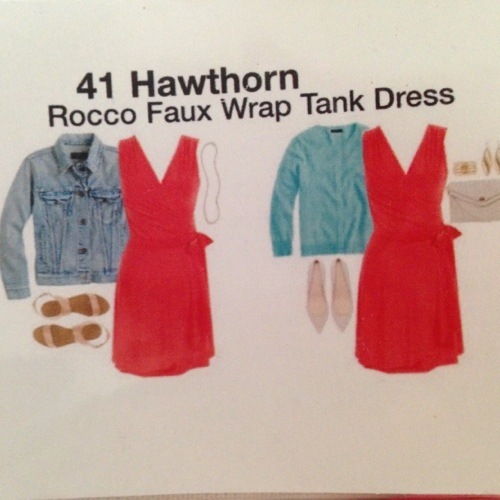 The beauty of Stitchfix is you pick your pricing. When you fill out that 80 question quiz in the beginning they ask you how much you want to pay for certain items like accessories, tops, and bottoms. You select the price range and they send you items within that range. That is a cute top and looks great with the red pants. Great review – it’s funny how these sites are popping up and for women, it’s 80 questions. The Wife has a membership with a men’s version and his list of questions were about 20 and in cartoons. Hehe. I’m wondering if these pieces are from known brands? Hey Chris! That’s funny about the men’s membership program. Most of the brands are known. I’ve gotten a lot of stuff from BB Dakota. I am actually probably not the best person to ask just because I don’t know much about labels anyway. LOL. But this is a great service for fashion challenged people like me. I don’t think I’ve been to the mall to buy clothes in almost 6 months! Crazy! What a cool service! I wonder if they have all sizes? Totally gonna check it out. Love it. They do come in all sizes. Just make sure to put your sizes down accurately when you fill out the questionnaire.